Gold mine | Ooh, my favorite! Just as I was talking up my black and yellow dress fetish, I happened upon a similar situation for shoes. This time just swap the yellow for gold and there seems to be quite a trend emerging. Also, don’t forget all the gold we saw at the Met Gala last week. Oh, and while we’re trending about the Met any of these numbers would complement a dark currant lip color so nicely. I haven’t had a pair of Jimmy Choo’s on my mind in a long time. Glad to have him back. I love the idea of this cagey look with an LBD and pearls. I never would have guessed that I’d have liked these YSL’s but there’s something so bold and timeless about them. I’m thinking paired with skinny cigarette pants and some gold armswag. 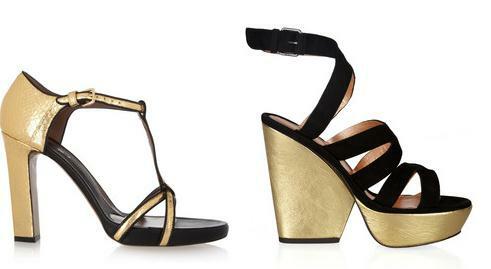 I’ll always be a sucker for a T-strap pump or a chunky platform sandal. 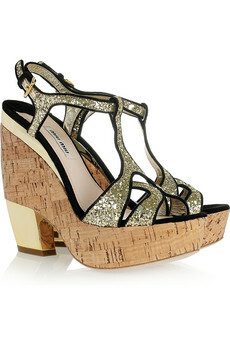 These are great fun and despite the glitter the cork wedge makes these guys much more casual. I’m beyond over Louboutin’s but these shoes seem to be both classic and forward at the same time. There’s plenty more to check out too, lots of sandals and flats that would work for summer. Hope you find something good!